Trials conducted during the North Norwich Distributor Road construction showed an increase in efficiency of 250% by using SidewinderUK® plant, compared to traditional swale construction methods. The trials set up by Balfour Beatty were to determine the best and most efficient method for swale construction. Using Sidewinder®, 350 linear metres of swale were completed in a day by the end of the trial, compared to an initial 100 linear metres at the start. Our unique Sidewinder® offset pavers place and grade any granular material into areas adjacent to carriageways where conventional plant struggle to compete. A Sidewinder® can place and grade 20 tons of granular or coated material in less than 5 minutes and can do this continually whilst taking material from a delivery vehicle secured to the Sidewinder®. The Sidewinder® can place and grade materials to either right or left of an adjacent running lane as opposed to a conventional paver laying behind itself. 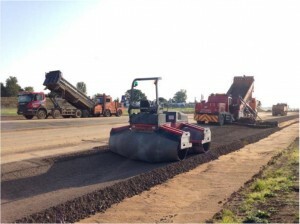 This offers a faster, cleaner and more efficient way of laying swales, installing a V channels or filter drains, constructing cycle lanes and footpaths, hardening a central reservation, road widening and haunching, or topsoiling and seeding verges. Compare this to a stockpile of material moved a few tons at a time – a digger to fill a dumper, a dumper to deliver the material for a second digger to place and grade the material in a separate operation. We are always prepared to go the extra mile. We are a small team and can take the decision to design and implement changes quickly. Our ability to solve problems for contractors can pay back big dividends for all stakeholders within the contract period. By adapting our machinery to overcome the issues inherent in each project, we are able to make our machines more diverse, resulting in increased utilisation. During the NNDR project, we offered several unique solutions, such as manufacturing a completely new screed, manufacture and trial of an extended auger, construction of an extension conveyor as well as manufacturing a bespoke trapezoidal roller for the project. The roller was sanctioned after we had already had the confidence to design it, so we were able to manufacture it quickly. “I do not believe we would have been successful in being awarded the contract if we had not trusted in our experience, and less progress would have been made in establishing best practise in swale construction,” said Richard Haley, Technical Director SidewinderUK®. We were very proud to have been involved in the trial which led to being awarded the work and we are very satisfied with the outcome. The section engineer, Alexandros Charalampakis, who was managing the work, was determined to fully test a variety of methods and measure all of them accurately. The following account is his report of the process and outcomes he measured. If you have a project you think we can help with please contact us here.